With a stay at Brisbane Marriott Hotel, you'll be centrally located in Brisbane, a 5-minute walk from Howard Smith Wharves and 14 minutes by foot from Queen Street Mall. This 5-star hotel is 0.8 mi (1.3 km) from Brisbane Botanic Gardens and 1.2 mi (1.9 km) from South Bank Parklands. Make yourself at home in one of the 267 air-conditioned rooms featuring refrigerators and LCD televisions. Your bed comes with down comforters and premium bedding. Complimentary wireless Internet access keeps you connected, and cable programming is available for your entertainment. Private bathrooms with separate bathtubs and showers feature complimentary toiletries and hair dryers. For lunch or dinner, stop by Motion Bar and Grill, a restaurant that specializes in international cuisine. Dining is also available at the coffee shop/café, and 24-hour room service is provided. Quench your thirst with your favorite drink at the bar/lounge. Buffet breakfasts are available daily from 6:00 AM to 10:00 AM for a fee. 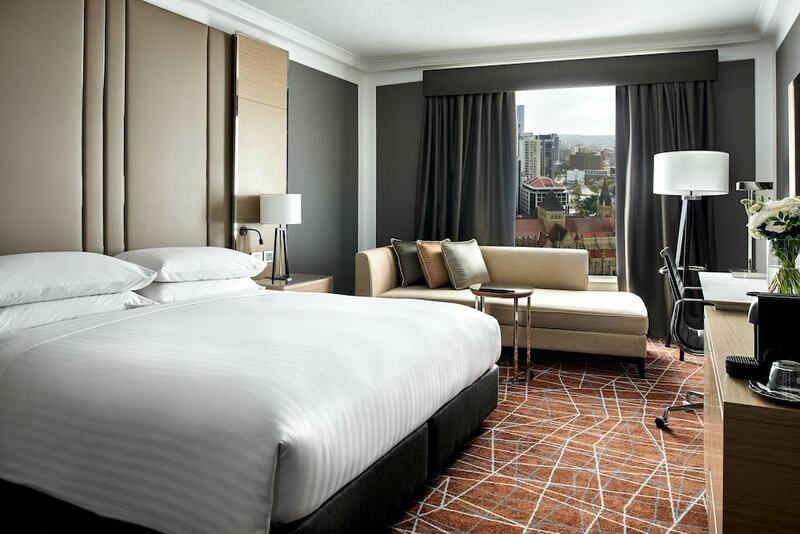 The Brisbane Marriott Hotel is a luxury hotel, located in the heart of Brisbane, between the business and entertainment districts of Fortitude Valley; chic shopping, riverside dining, and the cultural heart of Brisbane are just a stone's throw away. The Executive Lounge offers complimentary evening drinks, canapés, and desserts, along with WiFi access for a surcharge. Further amenities include a swimming pool, a spa tub, a sauna, and a 24-hour fitness center. The adjacent Dome Spa Retreat provides full-service spa facilities, including a range of massage, body, and water therapies. A roundtrip airport shuttle is available for a surcharge. The hotel offers self and valet parking for a fee. The Brisbane Marriott Hotel has comprehensive conference facilities that include 720 square meters of space for meetings, conferences, or weddings. A full-service business center provides a range of support services and facilities. Level 26 boasts the Executive Lounge that offers views of the river and Kangaroo Point Cliffs. The hotel's Executive Lounge, open from 6 AM, is a private and quiet place for guests to start their day. The Lounge offers a mouthwatering selection of hot and cold breakfast items, juices, tea, and coffee. Guests are invited to enjoy a glass of wine or sip a cocktail. The Lounge is open 24 hours a day and also offers a self-serve espresso coffee machine and snacks. For business or leisure the Executive Lounge is the perfect retreat. The multi award-winning Brisbane Marriott Hotel is regarded as the premier event venue in Brisbane. Divided over two floors, the nine function spaces are ideal for any size and type of event. The dedicated event coordinators will take care of every detail for each function. The chefs at Brisbane Marriott Hotel serve guests a daily delegate menu for each working day. Offering a new twist to conventional conference dining, the Brisbane Marriott Hotel is renowned for its tantalizing made-to-order menus and has created an “Explore Brisbane” delegate package that captures the spirit of iconic local areas and brings them to life as a culinary adventure. Conference/function room(s): Wood paneling and abstract artworks decorate the comprehensive conference facilities, which are spread over 2 levels. The breakout areas on level 2 are on a mezzanine level and look down into the lobby, benefiting from the natural light of large windows. The Grand Ballroom is 204 square meters and can hold 250 people in theater style, 160 in banquet style, 120 in classroom style, or 250 for cocktails. The Queen Adelaide Ballroom has floor-to-ceiling windows and is 202 square meters in size. It holds 120 people in theater style, 65 in classroom style, and 200 for cocktails, and can be divided into 2 separate areas. Both have natural light from large windows. The Makore Boardroom, which has an unusual round window, is 36 square meters and is suitable for 18 people. There is also an executive boardroom for 6 people, and 2 further meeting rooms. Buffet breakfasts are available for a surcharge and are served each morning 6-10 AM. Motion Bar and Grill - Australian cuisine and modern dining, plus al fresco dining. The restaurant, which has a bar, serves breakfast, lunch, and dinner in addition to high tea. Headed by Executive Chef Peter Iwanczyk, this venue lets diners sample an innovative menu that remains grounded by locally-sourced ingredients, including some of the best Queensland prime steaks, oysters and the finest wines. Coffee is served in the lobby, and a snack bar is available. A fitness centre on the fourth floor of the Brisbane Marriott has cycle machines, a rowing machine, treadmills, press machines, and other equipment. A men's and women's sauna is adjacent. On the terrace, a 10-metre covered swimming pool and spa tub has views of the river and city. The Dome Retreat, a full-service spa facility, occupies the same floor. Brisbane offers a good range of sport and recreation within the city boundaries, and long riverside promenades that extend for several kilometres are ideal for walking and cycling. Within thirty minutes' drive, there are also opportunities for skydiving, scuba diving, snorkelling, sailing, and surfing. The concierge can assist with walking, jogging, and cycling maps for the inner city. The 18-hole Victoria Park Golf Course is just five minutes by taxi. The Dome Spa Retreat is a full-service spa and swimming pool area. Although it is independently operated, it has a close working relationship with the hotel. The Dome Spa Retreat aims to provide an inspiring and invigorating sanctuary for the soul. Professional therapists combine preventative and healing therapies to support lifestyle and skin care goals.